Below we’ll walk you through an example of how Orchestra could be used in a newsroom by journalists, editors, and photographers to craft a story. The code for this example can be found in our github repo. An editor finds a good story and sends a reporter off to investigate. The reporter writes up a draft article. A more experienced reporter then reviews the article and suggests improvements. In parallel with the reporting step, a photographer captures photos for the story. A senior photographer reviews the photos and selects the best ones. The selected photos are resized and recolored for display across different media. Finally, a copy editor adds headlines and photo captions to complete the story. To make things work in practice, there’s also a hidden machine step at the beginning of the workflow to set up some google documents and folders for article writing and image storage. If you haven’t followed the getting started guide to set up Orchestra yet, you should do that now. Also, make sure that 'journalism_workflow' is in your INSTALLED_APPS setting, and that you have loaded the workflow into the database (python manage.py loadworkflow journalism_workflow v1). The journalism workflow requires Google Apps integration to run, so make sure in orchestra_settings.py you set settings.GOOGLE_APPS to True, and fill in values for settings.GOOGLE_SERVICE_EMAIL, settings.GOOGLE_P12_PATH, and settings.GOOGLE_PROJECT_ROOT_ID. Set up and correct values for those settings are described in the Google Apps documentation. username: journalism-editor, password: editor. A worker with editor certification. username: journalism-reporter-1, password: reporter. A worker with entry-level reporter certification. username: journalism-reporter-2, password: reporter. A worker with review-level reporter certification. username: journalism-photographer-1, password: photographer. A worker with entry-level photographer certification. username: journalism-photographer-2, password: photographer. A worker with review-level photographer certification. username: journalism-copy-editor, password: copy-editor. A worker with copy_editor certification. Make sure Orchestra is running with python manage.py runserver. This will take a bit (because it is automatically running the document creation workflow step), but will eventually return a project id (probably 1), which you should store for future use, and output JSON info about the project. Fill out the high-level story idea and submit the task. 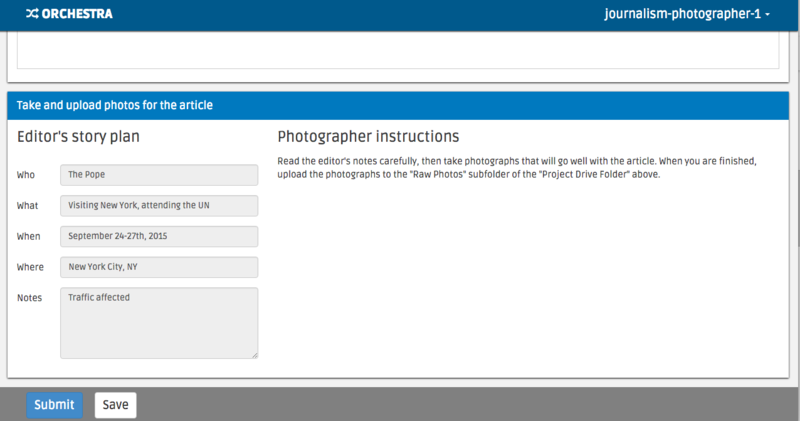 Next, log in as the journalism-reporter-1 worker, and you should now have a reporting task available. 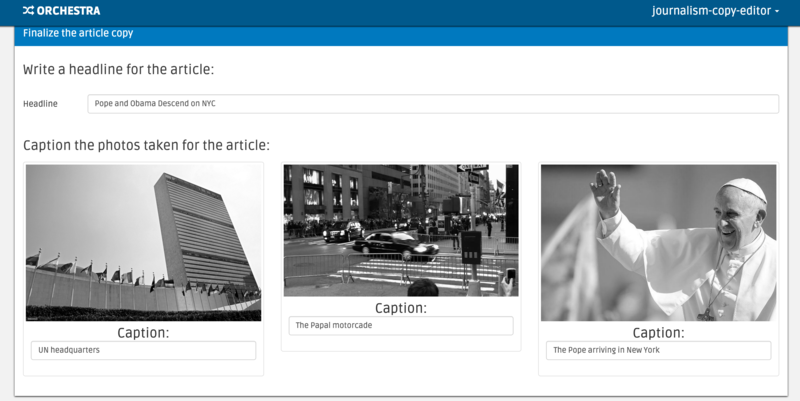 The interface looks like the image below–use the google doc to write your article. When you submit, you’ll note that the task appears in the ‘Awaiting Review’ section. That’s your cue to log in as journalism-reporter-2 and review the work. Once you’re satisfied with it, accept it. Once you’ve accepted the photography as journalism-photographer-2, the machine task to auto-process the photos should run. Our implementation simply makes any images in ‘Raw Photos’ greyscale, but you could imagine more complicated adjustments. Once you submit the task, the workflow is done! You’ve successfully coordinated 6 expert workers and 2 machine tasks to tell a story. where <PROJECT_ID> is the project id you were given when you created the project. which summarizes all of the work accomplished in the workflow. All of the code used to create the new room workflow is located in our github repo. There are three main components to the code: The workflow definition, the interface implementations for the human steps, and the python code for the machine steps. The workflow is defined in journalism_workflow/workflow.json, and its latest version (version 1) is defined in journalism_workflow/v1/version.json. These files declaratively defines the steps listed above, in programmatic form. 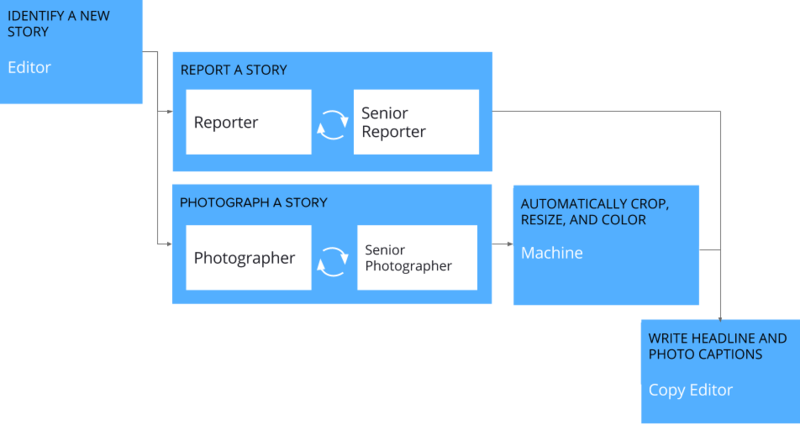 "description": "Trained in planning story ideas"
"description": "Trained in researching and writing articles"
"description": "Trained in taking photos for articles"
"description": "Trained in assembling photos and text into article layout"
version.json defines the steps of the workflow. Check out the source for all of the step definitions, but here we’ll list two. The basic arguments are similar, but we specify the step type as not human ("is_human": false), and insead of a user interface, we pass a python function to execute (autoadjust_photos here). In order for our workflows to be usable by experts, we need to display an interface for each human step. Orchestra uses angular.js for all of our interfaces. The interfaces all live under journalism_workflow/static/journalism_workflow. to ensure that the task data is passed to the controller. orchestraService has useful convenience functions for dealing with the task data like orchestraService.taskUtils.prerequisiteData($scope.taskAssignment, stepSlug, dataKey), which will get the taskAssignment for the previous step called step_slug (and optionally the data specified by data_key). 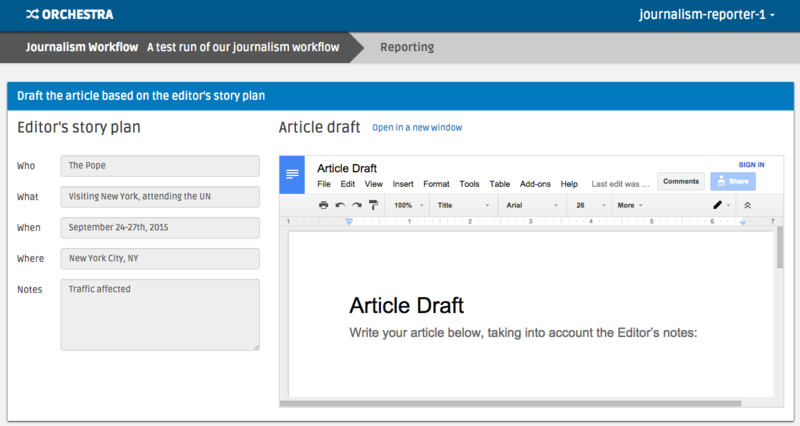 And of course, please refer to the newsroom workflow step interfaces as examples. Our workflow has two machine steps, one for creating documents and folders, and one for adjusting images. It takes two arguments, a python dictionary containing global project data and a python dictionary containing state from all prerequisite workflow steps (and their prerequisites, and so on). The function can do whatever it likes, and returns a JSON-encodable dictionary containing state that should be made available to future steps (in the prerequisites argument for a machine step, and in the angular scope for a human interface). For example, our image adjustment step (in journalism_workflow/v1/adjust_photos.py) gets the global project directory from project_data, uses Orchestra’s Google Apps integration to create a new subfolder for processed photos, downloads all the raw photos, uses pillow to process them (for now it just makes them greyscale), then re-uploads them to the new folder.